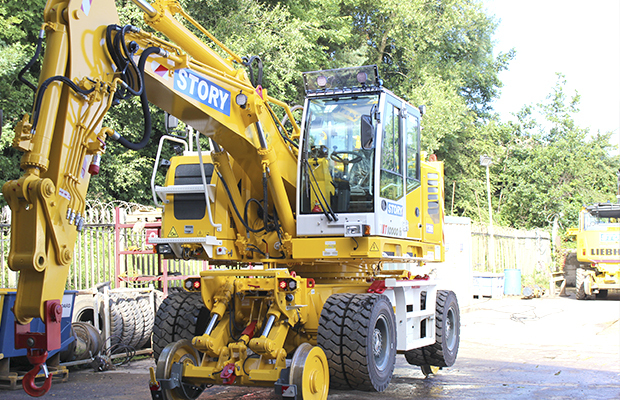 Story Contracting’s Plant division has invested £2.8m in a new fleet of Colmar T10000s. These machines will service the rail infrastructure for an average 20 year period. Three out of the ten arrived at our Burgh Road depot this week and will be heading up to our Scotland depot later today, working the weekend on the rail infrastructure. These new machines boast an 180kw engine with a higher pressure hydraulic pump which make them capable of powering a Movax piling attachment. These allow the machines to run more efficiently and give greater capabilities, making them more saleable to the client. Three brand new, double cab Tipper Vans were also delivered today replacing their time-served predecessors. 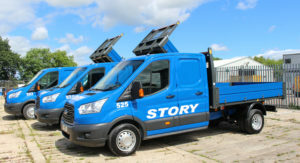 This brings us to a total of 50 new Story vehicles and machines purchased this year. This is a great reflection on how fast our business is growing, the investment being made as part of our long term strategy to deliver the best for the client and nurture a strong brand.